Mac Space Reviver is the PUP that uses misleading techniques to prevent removal. Use Reimage to locate malicious components and get rid of them faster than with uninstall instructions. A full system scan blocks virus reappearance and prevents traffic to malicious domains. Mac Space Reviver is a program that is promoted as a tool that allows cleaning duplicate files on Mac computers. Nevertheless, it may seem like a useful tool for those who make their Macs messy; it’s a potentially unwanted program (PUP) that might sneak into the system unnoticed and trigger other unpleasant activities. Danger level Medium. PUP cannot damage the system but is capable of getting installed unnoticed and performing misleading activities on the machine. 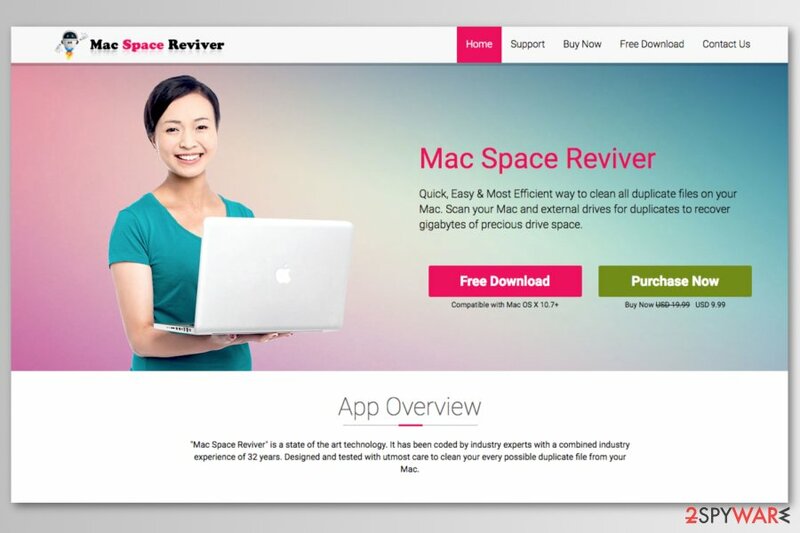 Mac Space Reviver has an official website where developers offer to download the program for free. However, if you have antivirus installed on your PC, the msr_msite.pkg file will be reported as dangerous as soon as the download is completed. However, users may not be able to take advantage of all promised features unless they buy a full version for 8.11 EUR. Indeed, it’s not an expensive subscription for 12 months. However, it’s a barely useful program. Clean duplicate photos, music & a lot more from your Mac & recover valuable drive space. bring the potentially unwanted program to the computer. Developers do not clearly state why they need such this information and whether it will be disclosed to third-parties. Hence, it might put your privacy at risk, especially if you decide to make the purchase and reveal credit card details. However, in any case, Mac Space Reviver removal should be completed before something bad happens. We do not recommend using developer’s suggested uninstaller to remove Mac Space Reviver from the device. You can get rid of this program by following our prepared manual elimination guide at the end of the article. Or you just run a full system scan with Reimage and let this security tool clean and fix your Mac. Mac Space Reviver is a potentially unwanted program for Mac that might display fake positive scan results to promote paid version of the software. As you already know, the program has an official website. However, MacSpaceReviver.com is not the only download source. This Mac cleaner is also available on third-party download sources, spread bundled with freeware and is promoted on ads. The program is most likely to get into the system unnoticed when you download apps from third-party stores. These programs are usually software bundles that contain numerous additional programs that usually PUPs. You agree to install freeware package every time you choose Quick/Recommended settings which do not openly disclose about such promoted apps. For this reason, you have to stick to Advanced/Custom settings and monitor the procedure. If you see the list of pre-selected “additional downloads,” remove the ticks next to them and stop their installation. What is more, while browsing the web, you might also discover Mac Space Reviver ads which offer to install software to get more space on your machine. These ads might be displayed on high-risk sites or any other site if you have adware installed on your PC. Specialists from avirus.hu remind that it’s dangerous to install programs (or updates) from pop-ups or other ads. Many unwanted apps and malicious programs are spread in this way. Hence, you can get easily infected with malware. The official website offers to download uninstaller which is supposed to get rid of the program. However, this Mac Space Reviver removal method is not recommended. It might operate as spyware and collect your passwords which might be used for hacking your PC or committing other crimes. To remove Mac Space Reviver from the machine, you have to navigate to the Applications folder and move this program to Trash. Additionally, you have to eliminate all program-related files. To do so, you can follow the guide below or use anti-malware software. Here, look for Mac Space Reviver or any other recently installed suspicious programs. The guide below will help you to remove Mac Space Reviver malware and its related files from Mac OS X. However, we also recommend resetting web browsers installed on your machine to delete tracking cookies that may have been installed on them. Wait until you see Applications folder and look for Mac Space Reviver or any other suspicious programs on it. Now right click on every of such entries and select Move to Trash. When in the new window, check Delete personal settings and select Reset again to complete Mac Space Reviver removal. Once these steps are finished, Mac Space Reviver should be removed from your Microsoft Edge browser. Here, select Mac Space Reviver and other questionable plugins. Click Remove to delete these entries. Now you will see Reset Firefox to its default state message with Reset Firefox button. Click this button for several times and complete Mac Space Reviver removal. Here, select Mac Space Reviver and other malicious plugins and select trash icon to delete these entries. 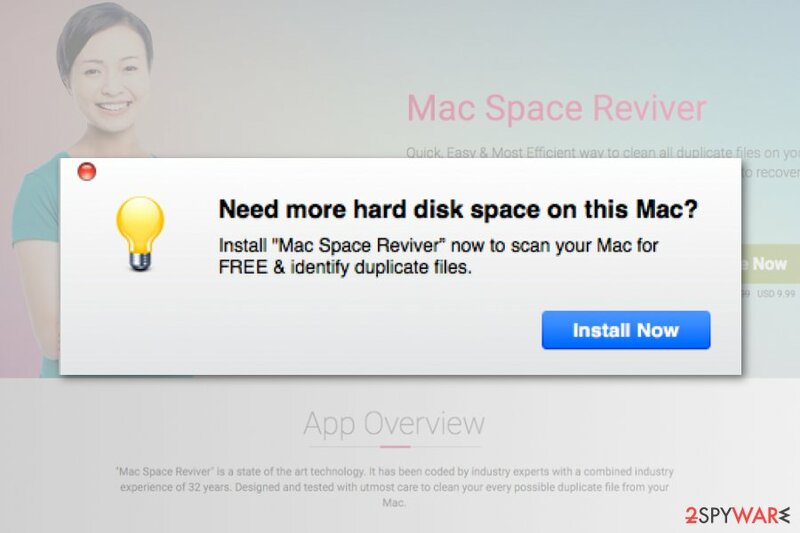 Click Reset to confirm this action and complete Mac Space Reviver removal. Here, select Extensions and look for Mac Space Reviver or other suspicious entries. Click on the Uninstall button to get rid each of them. Now you will see a detailed dialog window filled with reset options. All of those options are usually checked, but you can specify which of them you want to reset. Click the Reset button to complete Mac Space Reviver removal process. ^ Tracking Cookie. Techopedia. Defining the latest tech buzzwords. 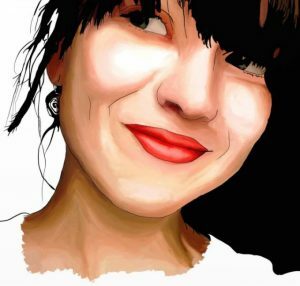 This entry was posted on 2018-03-16 at 03:34 and is filed under System tools, Viruses. You can quickly scan the QR code with your mobile device and have Mac Space Reviver manual removal instructions right in your pocket. How did you remove Mac Space Reviver?